Is ranked joint 76th with 2 other trigs (more). No FB. Pillar damaged, but bizarrely the spider and cap are still present. Lovely views on a day when cloud and mist were around at the height of the top and at lower levels, but there was always a view in some directions. 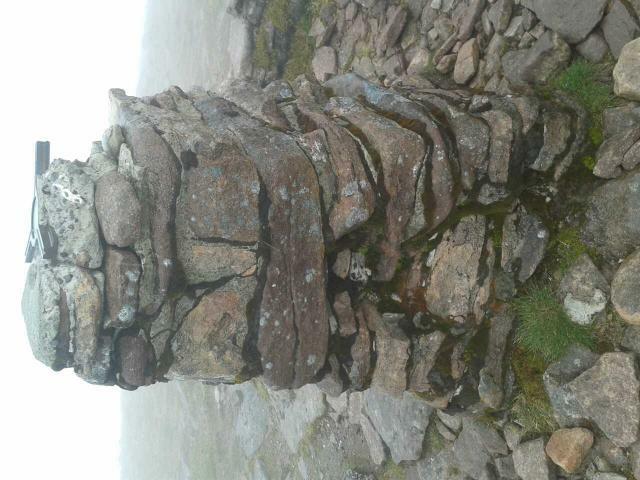 Stone pillar in weathered condition. No Fb. Stunning views on a windy day. Small shelter by trig. Climbed this superb mountain from Kinlochewe where i was staying at the bunkhouse. Long walk in (& a seemingly longer walk out!) along the Kinlochewe river before a fairly steep climb into the corrie,which is a fantastic place in itself. 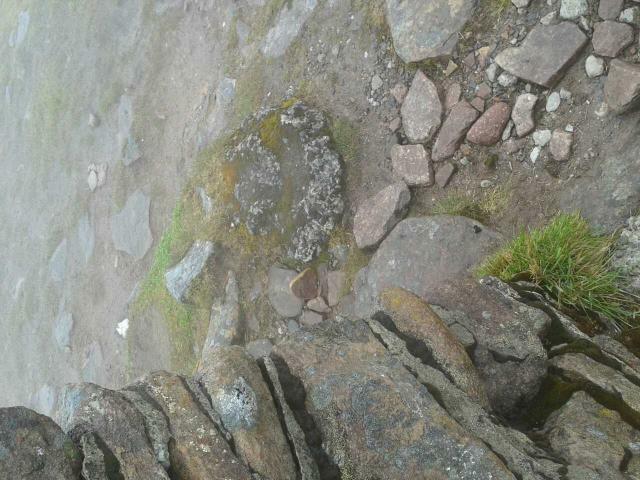 At this point the clag descended & no views were to be had from the summit. Trig looking in a bit of a sorry state. 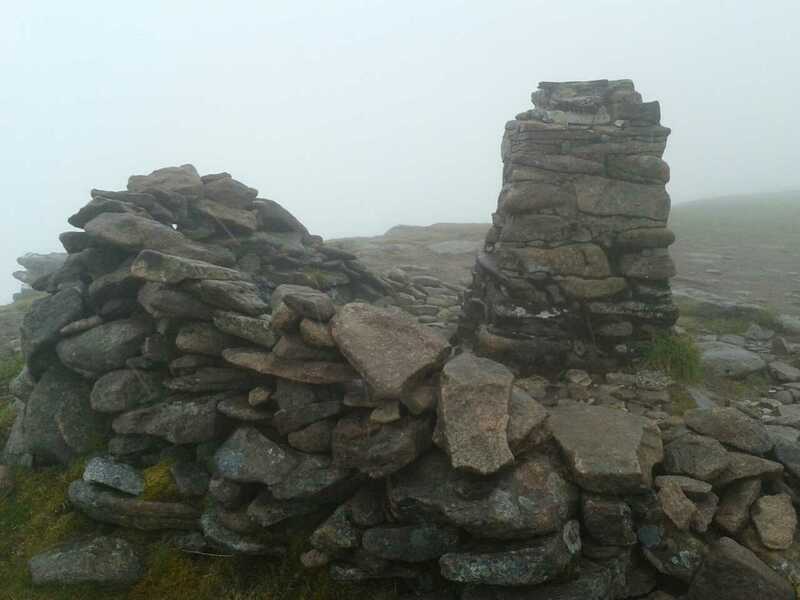 After the trig,carefully navigated along the top to the true summit cairn before heading down via the lochans to the south. Great day out despite the lack of views. what a stunning day with Jamie and dog Ben-Ji. Sad to see flush bracket looks like it's been gouged out by someone and top spider damaged. I took a pencil rubbing on cartridge paper of the top and spider. 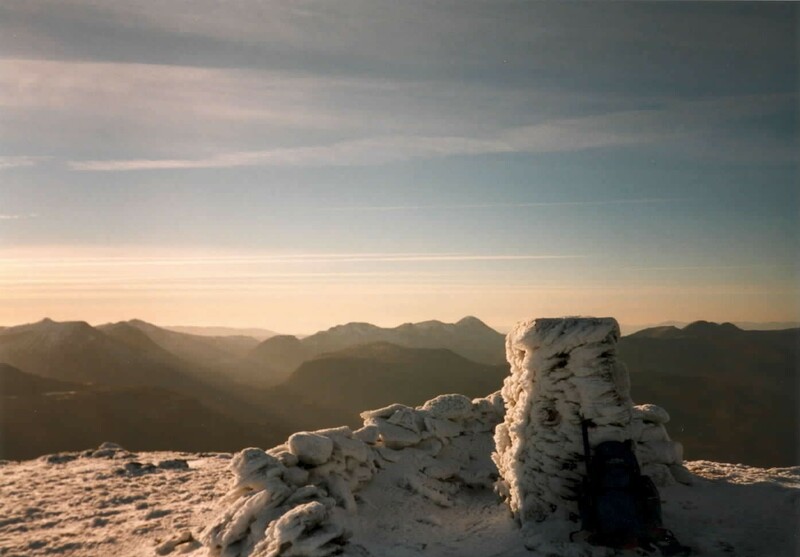 Sat on Slioch summit with still air and stunning views all round and I left my camera back in Torridon YH. Bah Humbug! Well done Chalky! Just 15 mounths into my 601 three thousand footers of Scotland - this was number 95. Wonderful views of never ending mountains - can't beat it. 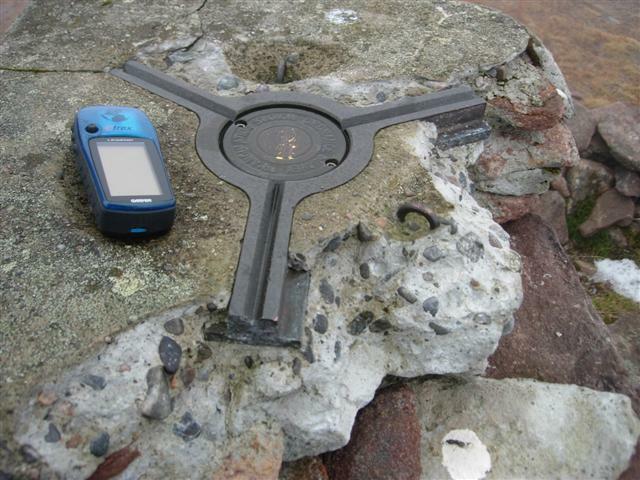 Stone-built trig with spider intact ( raised lettering ) but FB missing and damaged at top partially exposing spider . Early start from Kinlochewe along path to Letterewe ( 7ft high bracken! ) then over Beinn Lair to it's 2 tops Sgurr Dubh and Meall Fhuaran to complete the Corbett tops then over very tough terrain not evident from map to Meall Daimh and completion of the Graham tops before a steep pull up Sgurr an Tuill Bhain and along the ridge to Slioch to complete my 2nd Munro round ( 26 years in the making ! ) A very, very full day. 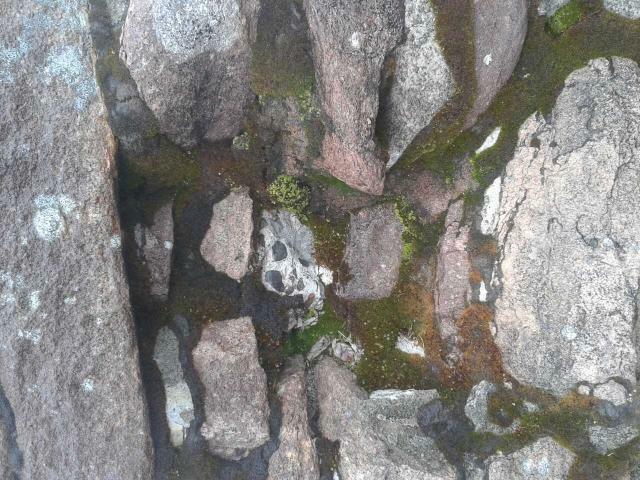 Previously visited Slioch 25/05/80 no trig details noted. After an hour of light hail I came out above it to find clear blue skies. I would agree this is probably the best Trig in the country as the views are just stunningly beautiful. Stone-built pillar, FB missing. Approached via the usual Munro route from Incheril. We had a great day great weather at low level, a big climb :-) large plato great desent. Cheers dave. The flush bracket is completely missing, and there are bits of stonework missing. Views are spectaclar. Slioch Trigpoint Top corner of trigpoint damaged, and flush bracket gone. Great day out from Kinlochewe. Nice stone built pillar. Saw both deer and goars near the summit. View north into the wilderness can't be beaten. First of 3 visits, No photos on the first trip and none of the trigpoint on subsequent vists which were both in clag. 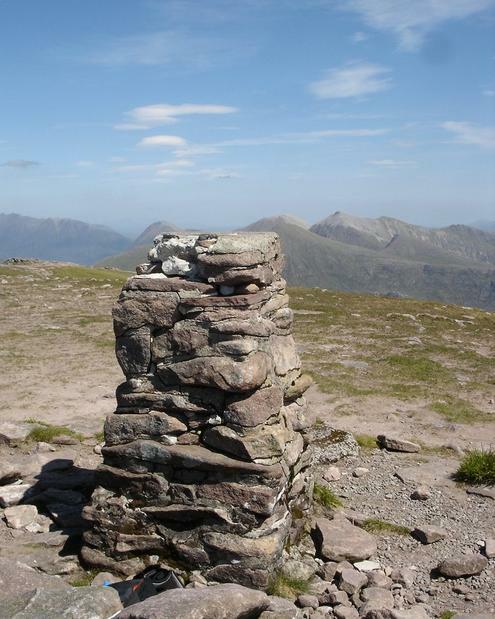 Last visit was with a friend who was compleating his munro round. 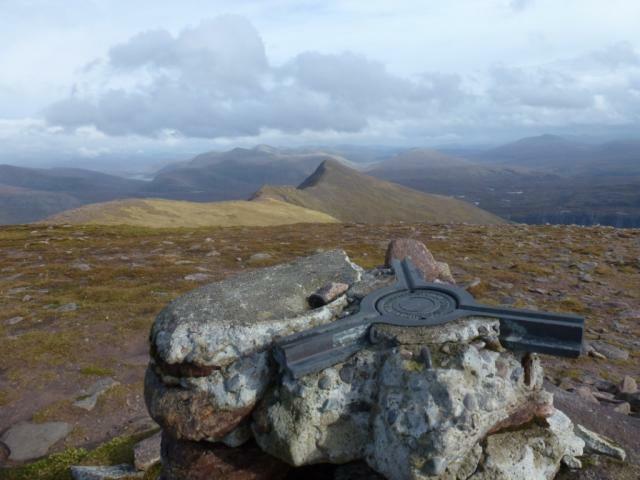 Due to mix abilities and time constaints we didn't go on to Sgurr an Tuill Bhain, in my opinon the best bit of the hill. 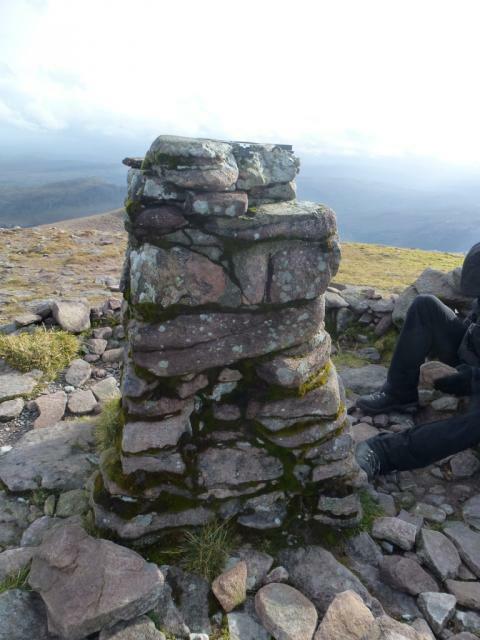 Only recorded this old visit on 3/9/11 as have a clear photo of me standing on the pillar in 97 whilst visiting the hill for a Munro bag. In the place to be :-) Must be a candidate for the countries finest! There had been hard frosts for the last few nights and the ice formations were something to behold, huge bosses in blue, green and even black, and made for good fun front-pointing up onto the ridge. Had left a bit late from the bunkhouse and had only just started the descent when the sun set and headtorch came out. Carefully back down to the shores of Loch Maree by which time the moon was out and the rest of the walk out was a delight. A tough 20km round trip, but so far it gets my vote for the best trig in the country. 1st visit in 96 all i remember there was a lot of snow have been back, 2 more time. Nothing recorded, it is a great mountain. With Terry and Iain in bright sunshine + rescued a walker with severe dehydration. Feral goats over back of summit. Annual Easter trip to Scotland with Kevin Ryan and Andy Hall. Escape from a very midgy campsite. One of the first hills upon which I noticed path formation. 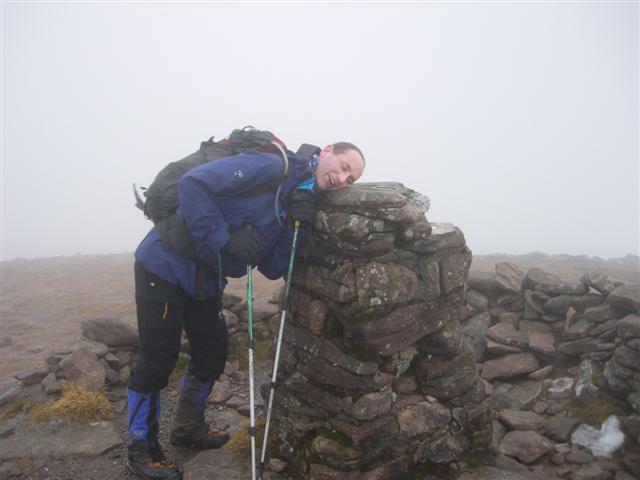 A standard on the Torridon circuit.. because its so good! 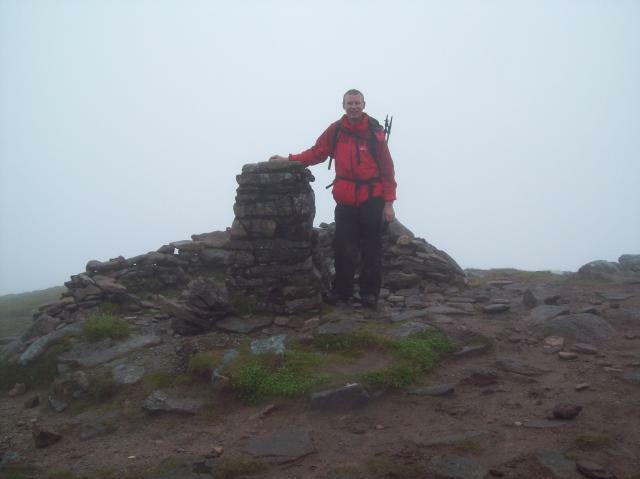 One of my first 10 Munros and still one of my best. thin swirling mist...with school friends a few weeks after doing 'A' levels.